When I first started blogging almost 7 years ago, I was really clueless about what it really meant to "blog" about fashion. 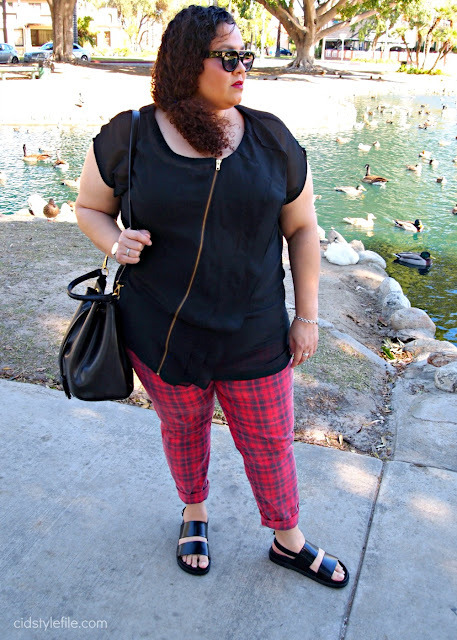 Initially I was not planning to show my outfits, but outfits were what I loved about other bloggers so why not share my outfits too. Once I got comfortable with posing and taking outfit pictures, it made want to buy more clothes to create outfits for the blog. It can be a vicious cycle of shopping and over spending. Seems like if you are a fashion blogger you have to be on top of all the latest trends and styles, at least that's the expectation. It was actually exhausting and realistically not financially responsible for me to keep shopping just for the blog. Between working full time and supporting my self, there was no way I could spend tons of money or time on outfits for the blog. 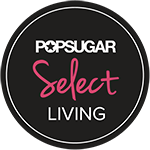 Sure as a blogger some of us get freebies from brands, to review and share on the blog. I have received my share of freebies and "swag" but can assure you it's not to the point where I have a closet full of free clothes and shoes. Don't we all wish to have closets full of new and stylish clothes for free! Sadly unless you are super popular with hundreds of thousands of followers its not happening for all of us. I bought and payed for the majority of the clothes I blogged about and it seriously got out of hand. I ran out of money and space in my closet for it all. I found my self buying things only because they were "on trend" and thought it would be good for the blog. 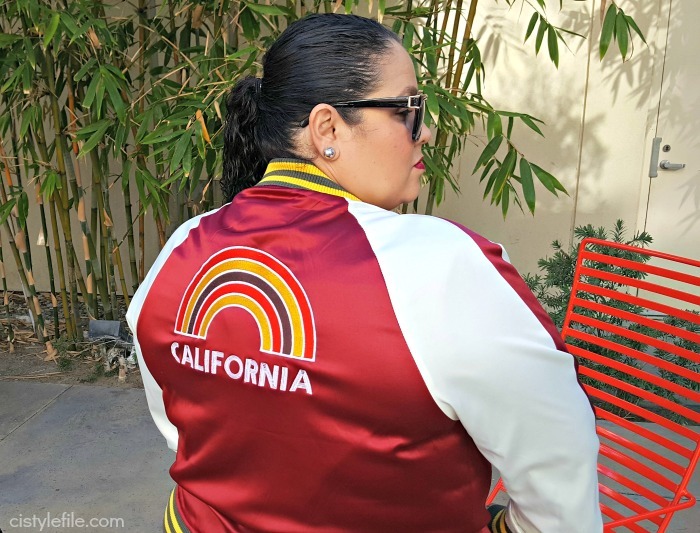 Some items I truly didn't love or really would wear if it weren't for blogging. I ended up with a closet full of clothes with tags still on and an empty bank account. I decided sometime last year to start shopping my own closet, start wearing what I have and what I love. Somethings you may have seen before and other items are a few years old. No shame is reusing your clothing more than once right! 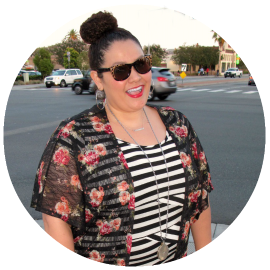 Seems like with blogging it was almost a sin to been seen with the same dress more than once! I know these are not things most bloggers will talk about or post, but I really want to be honest about how I feel. These feelings of not being able to keep up or compete with fashion bloggers is one of the reasons I considered quitting the blog. Since I am no quitter, I decided to take a new approach. Wear what I have in new ways and create new looks for the blog with what I already own in my closet. It won't make me the most popular blogger, but it will make me happy. Does this mean no more shopping for me? Umm heck no, I am a shopper at heart and can spot a good fashion bargain a mile away. The shopping will be kept to a minimum, buying only items I truly love and would wear, regardless of the blog. This outfit is one I've had in the closet for a few years. 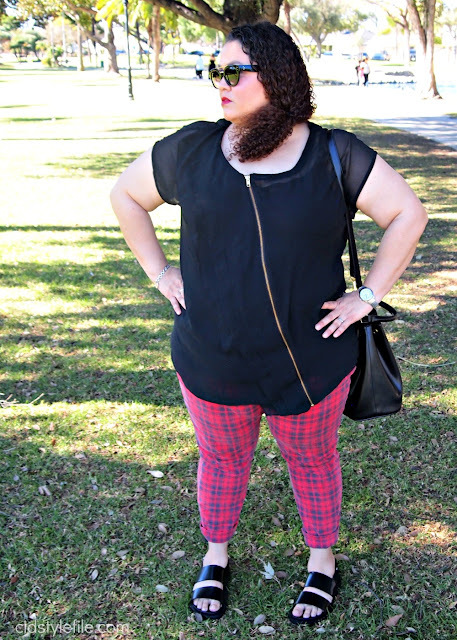 These pants haven't been seen on the blog before and I was thinking of getting rid of them. 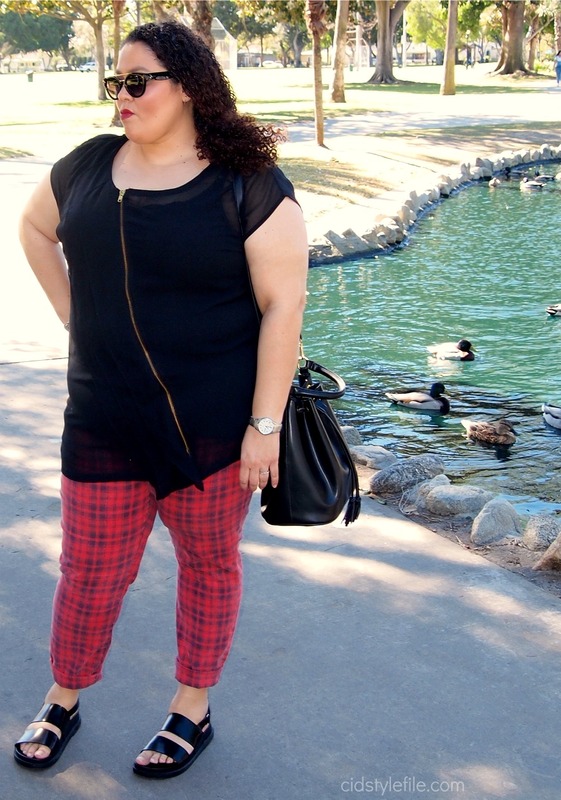 Although I love a good plaid print, I wasn't really a fan of wearing red pants. My boyfriend loves them and said "you better not get rid of those pants" thanks to him I kept them and will starting wearing them more often. Only new thing about this outfit are the sandals, I bought from H&M and couldn't resist such a great bargain at only $7! Do you ever feel like you can't keep up with your blogging niche? I totally understand how you feel. Last year, my budget took a huge hit when we moved to sunny California and I couldn't really add new items as fast as stores could stock them. It didn't help that some of my favorite stores where putting out product that i couldn't see myself wearing over and over again. I ended up taking a much longer break than usual and now I am really having to shop my closet more frequently as well. 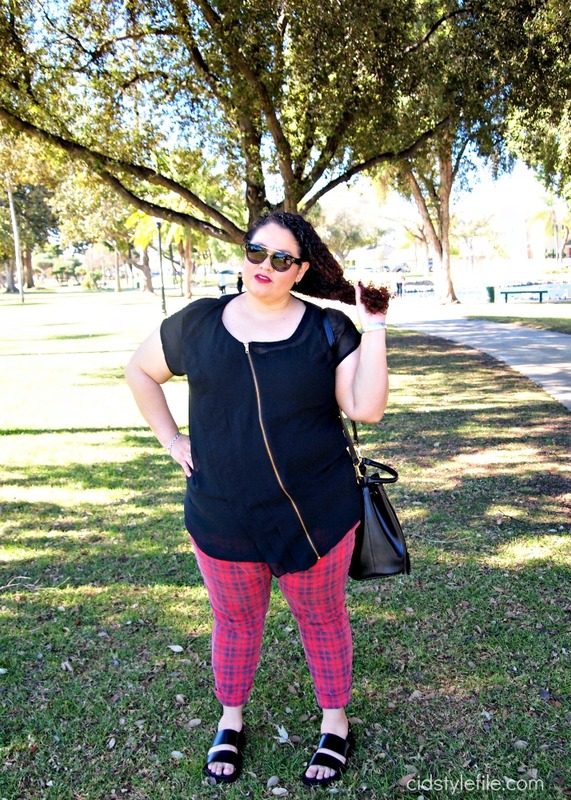 I'm glad you didn't give up on blogging or these awesome pants! I loved them when I saw them on Instagram and I love them more now that I've seen several shots of them. Keepers for sure! There is nothing better than knowing that the blogger you follow has a realistic approach to keeping up with the trends and finding their own comfortable look. You have always been a fashionista to me girl, just glad you finally found your zen with it. Happy closet shopping! Totally relate and I'm glad bloggers decide to write about how most of us feel. Nothing wrong with reusing out clothes for the blog because it's what we do in real life, and the blog should be a reflection of ourselves. Love that you blogged about this and love your new approach. Looking forward to more! Absolutely love this! I appreciate your honesty. This was my struggle while trying to decide if I wanted to revamp my blog. I'm a mom. I don't dress like the popular mommy bloggers who have perfectly manicured nails and wear the latest fashions. But I was told by moms like me that they want to see what i wear and hear my stories...which is why i didn't scrap it. You and I both love to shop but if I know anything about us, it's that we want to do our own thing. I'm not super trendy...but it works for me. I'm glad that you decided to stick around. I'm glad you decided to stick it out. Blogging is not always a smooth road but we can do it our way so we're not chasing some trend. Thanks for sharing your thoughts. I do prefer reading about someone who's keeping it real and sharing how they actually "participate in fashion" (if that makes sense) in their real life. I look forward to reading more of your posts! thanks for sharing.. i also have blog like yours about Harga Tablet advan update that you may can visit sometimes..